Meet Anthony Ezenwa popularly known as Tony Yankee, an award winning Afro beat singer and a graduate of Computer Science at Samuel Adegboyega University Ogwa Edo State; hails from Isiala-Umuzu Nwangele LGA Imo State Nigeria. He started music business professional since 2006 as rapper with his first debut single titled “Black Magicstic” a cover of 50 Cent song “Candy Shop”. Currently, he is working on his EP titled “Ehjii to the World” and he is being managed by an Award winning Entertainment and Media company Ambassador Showbiz Plus which is based in Africa. However, he has released songs like Piritunu, Okuto, Naija, Omo surulere, Candy, Beast from the East, Shaku, Owonikoko, kpo kpo mi, amongst others. According to an interview with him on Entertainment Splash TVC, “music is an expression of love, feelings, life and I use music to affect lives positively”. As a result, he went wild in this his video titled Wororo which has a fusion of Fela Anikulapo Kuti’s style; directed by Crucifix and produced by BMJ. 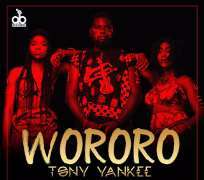 Follow him @iamtonyyankee to enjoy Wororo song and video.